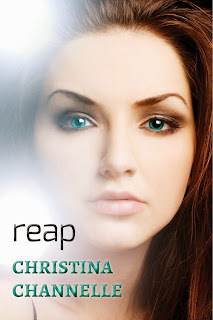 To celebrate the release of Christina Channelle's new, on the edge of your seat, paranormal novel Reap, scroll down to enter her one day only giveaway. Join her on Facebook from 2:00pm until 10:00pm E.T for hourly giveaways. Foreign, or rather unfamiliar, would be the word I would use to describe how I felt. Faintly, I could hear the glimmer of voices surrounding me in this dark haze, caressing my ears like skin against silk. I felt like I was in a cocoon of sorts, protectively enveloped, quietly drifting in some far-off place. I wanted to stay that way forever. But we all know that what you want never really seems to happen in the real world. Something’s not right in Mia’s head. The first thing is that her name isn’t Mia. In fact, she has no clue what her name is, who she is. All that she knows is that she’s not like the ones who found her: Dante with his kind blue eyes, Amy with her child-like demeanor, James with his questioning gaze. And Briggs. The one she cannot decipher no matter how hard she tries. As Mia tries to fit in with these people, a strange occurrence is amidst outside. And as she finally remembers who she is... Well, let’s just say that things get a little more complicated. I opened my eyes but had to squeeze them shut against the harsh lights. My lids felt swollen, heavy with fatigue. My eyes burned, tears leaking from their corners. It was the most uncomfortable of feelings. I must have been dreaming. Although the word seemed alien to me, almost as if I had never heard it before, I instantly understood its meaning. The voice that had spoken was warm, making me feel as if I were suddenly sitting in front of a fireplace, wrapped in a heavy blanket, flames crackling. The heat of the word practically licked my skin. Again, I tried opening my eyes, this time a bit more cautiously. Blinking, I slowly adjusted to the artificial lights, now able to see. I found myself staring back into a pair of bright blue eyes, a look of wariness in their depths. For a brief moment I couldn’t look away as I stared up at him. Then he cleared his throat and glanced away, as if uncomfortable with my gaze. With the spell of his eyes broken, it was then that I noticed I was lying on the ground—no, on hardwood floor. And with not one, but three interested faces peering down at me. I sat up, then winced at the abruptness of my movement, bringing my hand to the back of my head. I directed my eyes toward the person who had spoken such kind words. It was the first person I had noticed, the one with the blue eyes and the warm voice. His voice was deep and calming, and as I sat there I tried to think of the emotion I should be experiencing. Inhaling softly, I closed my eyes, ignored the painful throb in my head, and waited for the proper term to flutter into my mind. Satisfied I had found the correct word, I opened my eyes again to the voice speaking to me. It was a pleasant voice, reassuring to say the least, and immediately captured my attention. At that moment, I didn’t notice the black hair atop his head, a striking contrast against his blue eyes that looked like I was staring into an ocean. I didn’t notice that the corners of his eyes crinkled up when he smiled kindly at me, complementing the single dimple in his right cheek. By just looking at him, anyone could tell that he was someone who knew how to laugh. But I didn’t notice any of that. All those things I would notice later. I stared at the corner of his lips as he continued to speak, not toward me, but to the others present in the room. “Guys … I don’t think she understands a word I’m saying,” he mumbled softly, as if afraid I’d be insulted at the notion of not comprehending him. “I like her,” stated the girl kneeling next to him. She looked quite outrageous wearing a short black dress with a black choker wrapped around her neck, pink shiny embezzlements adorning it. Her white-blonde hair was extremely long, almost past her lower back, as the ends brushed the floor. I directed my gaze to her face and found blue eyes staring down at me. Her eyes were identical to the man’s. “It’s always the silent ones we should be weary of.” The words themselves were harsh, but as I looked to my right I was greeted by a kind smile with equally kind brown eyes behind wire-framed glasses. They belonged to a man casually sitting on a couch, his shoulder-length dark brown hair tied back. As he continued to stare, he tilted his head to the side as if analyzing a computer software program that wouldn’t work properly. I guess I was the computer software program. “James, help me out, will you?” the man with the blue eyes asked calmly. The man on the couch, James, stood up and slowly sauntered over to my side, then both he and the blue-eyed man grabbed my arms and brought me to my feet. I didn’t protest, shuffling alongside them as we entered a kitchen, where they placed me on a wooden chair next to a table. Sinking down into the hard chair, I averted my eyes downwards and focused on a crack on the wooden table. I knew I was still being stared at, three pairs of eyes boring holes into the crown of my head. It was difficult not to look up but I managed. I needed a distraction, so I started to trace the crack on the table instead, feeling the texture of the wood as it scraped against my skin. I find wood to be … quite rough in manner. “Here you go.” That calming voice spoke once again and I looked up to find a glass of orange juice placed in front of me. It was in that instant that I realized that I was thirsty. I reached for the glass, instinctively bringing the rim to my lips. The juice was cool down my throat. This was familiar: the taste of juice in my mouth. Closing my eyes, I licked my lips slowly, trying to memorize this feeling. Perhaps if I stayed like this long enough, I would be brought back to that time of familiarity…. “Yo, Briggs!” James’ voice beamed through the kitchen and I startled, setting the glass on the table, the clanking of the glass hitting the wood almost palpable to my ears. I hadn’t noticed the front door had opened—I believe an apartment building was where we were located—and a new presence had entered the living room. I looked over to where he stood by the stairs, utterly still. Although we were indoors, he wore sunglasses. And even though I couldn’t see his eyes, I knew they stared directly at me, hard as stone. If the man with the blue eyes was warm like a fire on a cold winter day, this man was like the wood I had just caressed: rough, jagged. A dreamer, Christina Channelle holds two degrees in health sciences but has always had a passion for writing. You will find her reading other young adult novels, or typing up a new story on her computer. When not writing, Christina spends her free time at the movies, listening to music, or eating sushi. She’s a reality TV junkie and has a close relationship with many characters on TV that have been a topic of many heated discussions among friends. She resides in Ontario, Canada. Thanks for sharing this competition Kelly! The blurb sounds really fascinating.